I am very pleased to present you the amazing chat module. It is very simple, and at the same time - an effective chat. 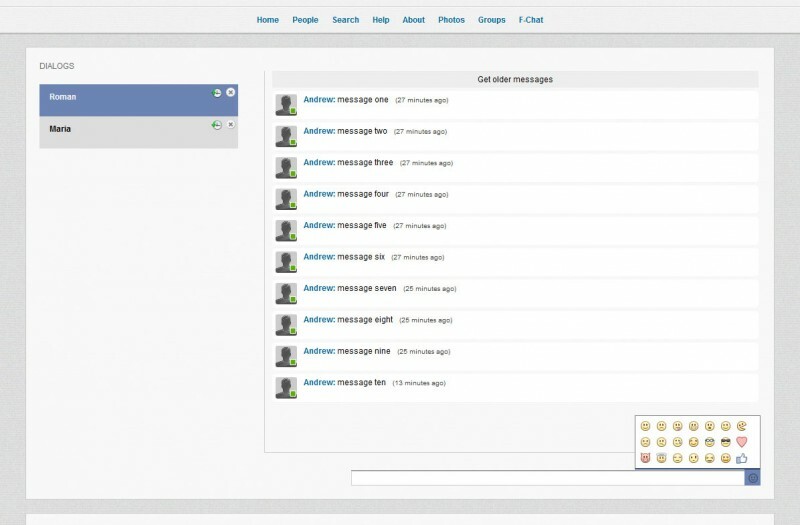 There is a principal (main) and private chat messenger. In a floating panel, we can see four lists: Last Members, My Friends, Online Members and Online Friends. 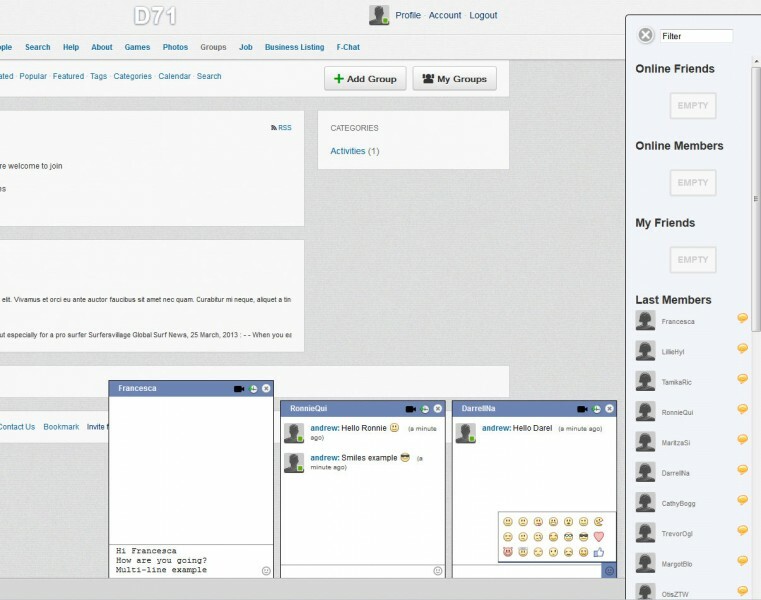 It is like facebook, the same layout and styles, you can see your online friends, online members and last members in a slide-out panel (on the right). The administrator can choose (in the settings) which groups to display on this panel. This Chat Module helps your members to communicate in more comfortable, habitual and easy-to-use way and spend more time on your website. 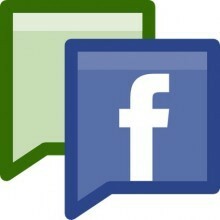 In fact, this is the most important part of ANY social network. 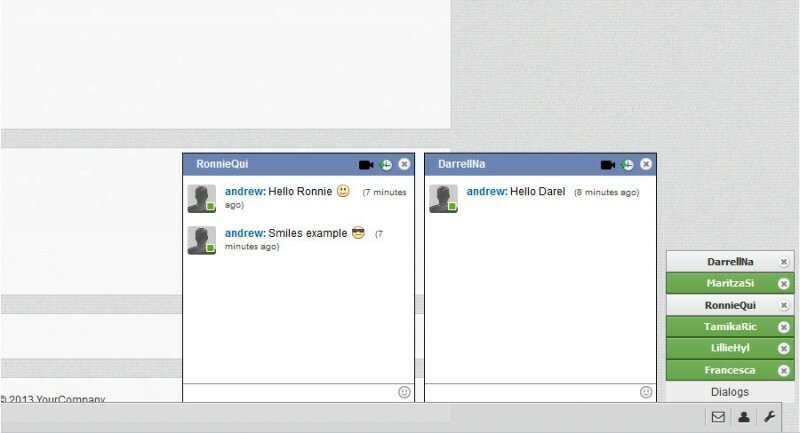 This is a great module ... works just like Facebook's chat ... you can customize colors and look. I highly recommend. I'm a newbie on here, and have to say one of the most important things to look for in a vendor is timely support. My experience with Andrew has been exceptional .... he is timely and efficient which is why I have ordered many apps from him. Very Nice! My members were very pleased with F-Chat over the standard messenger. Before we had F-Chat, I would regularly receive emails from different members asking how to initiate chat with other members. Yes, You can make FAQs for this, and often as the webmasters of our site, since we know where everything is, it's easy to feel like our members do too or at least they should right? That's not always so, and after installing F-Chat- There is no doubt, members know where it is, and that's the best see more solution! My members didn't hesitate to send messages thanking me for this module- So likewise Andrew I pass them on to you- THANKS! Great module! Also the support is excellent. FChat, as the name suggests, is similar to Facebook Chat and it's a great addition to be included for your social website. Members on Dolphin website can chat with each other seamlessly with FChat ! Just awesome. Really happy with this chat system. It's that good I just wish I could remove the dolphin chat system and use this mod instead. Great module, works as expected and very easy to install. Nice job !! Excellent, easy to install module with great customer support! The price is really high for the bugs I am seeing, the creator does not respond back to questions for such a high price, and I just feel robbed. It seems everything with Dolphin, people overprice. I would have paid 50 for this plugin and I know not to pay 100 dollars again to anybody here. So why mark it positive? Well I like the plugin no matter what the flaws I guess. If I had to rate based on installing, easy to use, and features it be 100%.